The latest GPU shipments results for Q3 2017 have just been revealed by Jon Peddie Research. The latest results show that NVIDIA increased their GPU market share by a very huge margin compared to AMD. 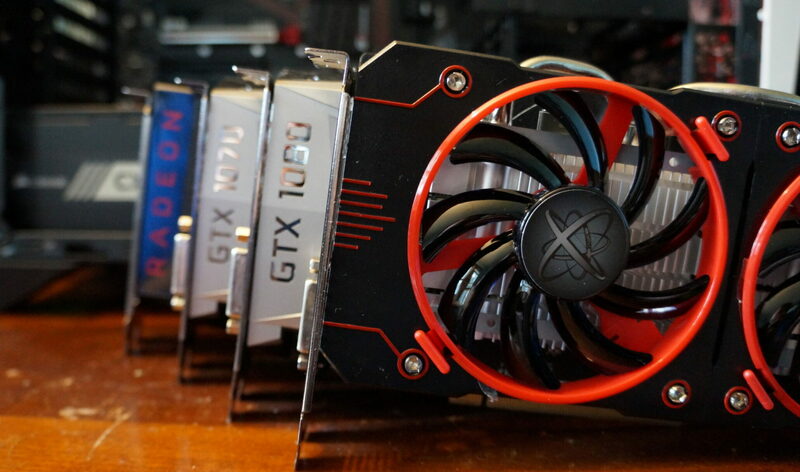 According to the report, the overall GPU shipments increased 9.3% compared to previous quarter. Looking at the yearly trend, desktop graphics increased by 2% while notebook graphics shipments decreased by 6%. The reason for the desktop side gain is mainly attributed to increased demand of graphics cards for gaming and cryptocurrency. This pushed more GPU shipments from NVIDIA and AMD than usual. 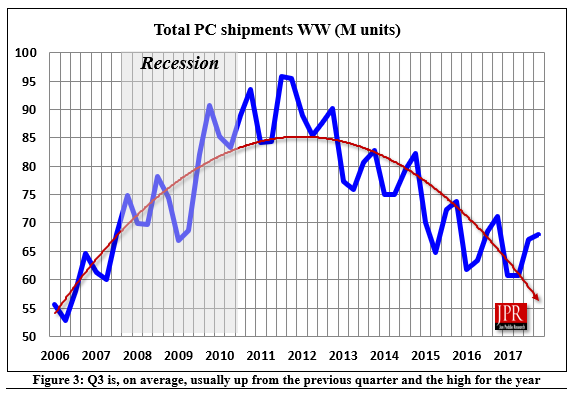 Once again, the gaming PC segment has been regarded as a bright spot for the entire GPU market in the quarter. Looking at a more detailed analysis of the quarter, we can see where the bulk o GPU shipments came from. NVIDIA, leading with up to 29.5% shipments increase currently stand with the top market share out of the two discrete GPU makers (AMD and NVIDIA). They have managed to increase their market share by 3% and now stand at 19.3% compared to 16.3% in the previous quarter. The reason for this huge market share gain is because NVIDIA saw an increased (34.7%) desktop discrete GPU shipments and also 22.4% increased notebook GPU shipments in Q3 2017. This makes NVIDIA the top company with the largest GPU shipments compared to both Intel and AMD. AMD on the other hand also saw an increased number of GPU shipments but lower than NVIDIA at 7.6%. The largest contribution to this was from their desktop discrete GPUs which saw an increase in shipments of 16.1% which was largely due to crypto mining. Their notebook GPUs also saw a bit action with increased shipments of 5.2%. The AMD APU side which includes the iGPU solutions are also accounted in the market share and saw an increase of 7.1% (Desktop) and 2.2% (Notebooks). 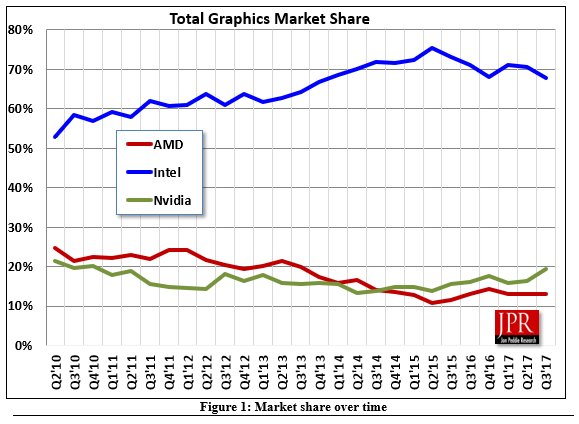 AMD’s GPU market share currently stands at 13.0%, a 0.2% decrease from the previous quarter. Last up, we have Intel whose GPU shipments increased by 5.0% compared to previous quarter in the desktop segment. Intel’s notebook GPU shipments were slightly higher than the desktop side at 5.9%. Overall, Intel was able to increase their GPU shipments by 5.0%. Their GPU market share currently stands at 67.8%, a 2.8% decrease from previous quarter. If we look at it from one perspective, NVIDIA single handily bested out AMD and Intel by shipping more GPUs to both desktop and notebook GPUs. Generally looking at Q3 2017, it is reported that discrete GPUs (notebooks and desktop shipments increased by 34.7% from last quarter and 11.7% from last year. Intel and AMD GPU market shares include both discrete GPUs and iGPUs. Intel has 99% of processors that ship with integrated GPUs while AMD have over 66% non-server processors that ship with integrated graphics. NVIDIA on the other hand primarily ships discrete GPUs. Overall, the quarter was good for the GPU industry but it remains to be seen what comes next as NVIDIA and AMD have launched their entire GPU lines and wait for the next generation has already begun.